Last fall, I received an invitation to join a new bee on Flickr. I had kind of sworn off bees for 2012, but when I realized who else was in the group, there was no way I was going to miss out on being part of this group. Each of us has been assigned a month where we get to make the decisions for the kind of quilt blocks we want. So I thought it would be fun to profile the each of the group members when it is "their" month. Which means that some time in August I will finally answer these same three questions myself. The month of January belongs to Jeni, from In Color Order. It's exciting to have Jeni here today. I have been a fan of her blog for a really long time. How did you choose the name for In Color Order? I love, love, love having things organized in color order. My clothes, fabric, collectibles, pretty much everything! It's something I've done since I was young, and it seemed like a good fit when I started my blog a few years ago! Were there other nbames you considered, and can you share any of them with us? I can't honestly remember if there were any other major contenders. I won't leave you with nothing though, I've had journals and a website since I was in 6th grade, so I'll share a few of those (somewhat embarrassing!) names! Let's see, my very first blog was called Heartfelt, then it was Scream Out Loud, Tender Lie, and finally Hope Driven. Hehe. Now that you are recognized by In Color Order, are you happy with it, or do you wish you could change it to something else? Very happy with it! I think I got lucky, I feel like it really fits my personality and reflects my tastes and sewing style well! I don't think I would be happy with anything else right now! 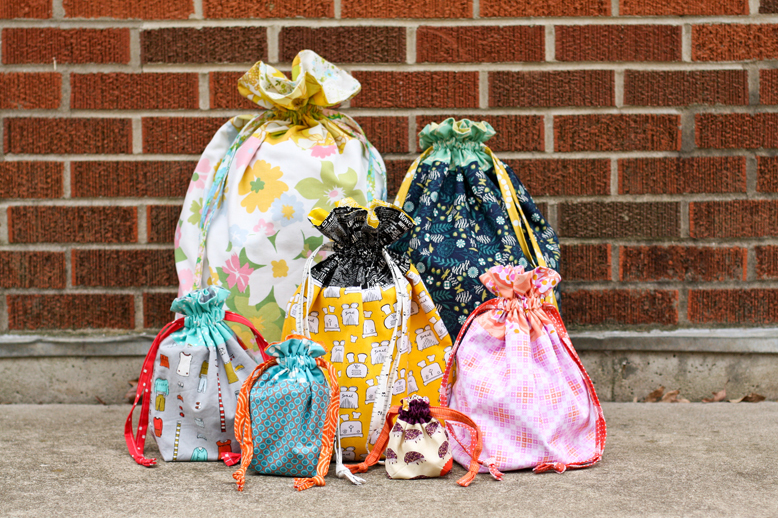 Jeni's lined drawstring bag pattern--in all these sizes. It's amazing. You can find it here. If you are a collector of vintage sheets, head over to Jeni's shop. It is very well stocked and you are sure to find something fabulous there. If you have never been to Jeni's blog, plan on spending some quality time there. She has an amazing amount of valuable information . If you are feeling uncertain about fabric choices, color choices, organizing your fabric, or building a stash, you are sure to find an answer here. 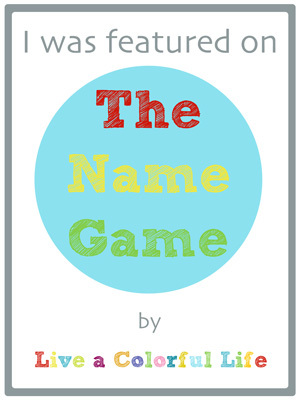 Thanks for playing the Name Game, Jeni! 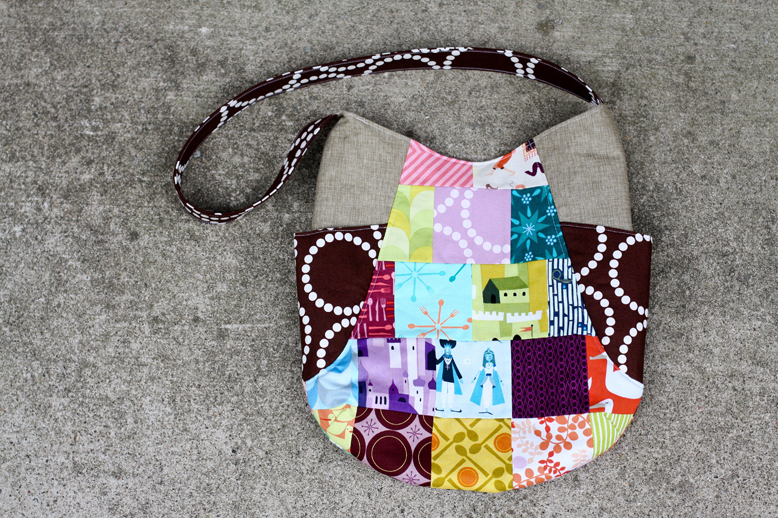 Jeni is being super generous and will give away her drawstring bag pattern to one lucky person. 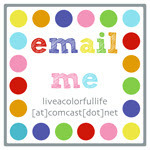 So let's find out a little bit about you--do you organize things in color order? Which is your favorite color? Let us know and Random Number Generator will choose a winner on Wednesday at noon PST. I wouldnt say that I live "In Color Order"- but definitely "In Color!" I collect Fiesta ware- Love that stuff! The more colorful & mixed, the better! 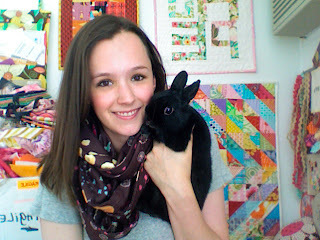 I have been following Jeni's blog for a while but I dont have a blog of my own. My current favorite color is purple, but that changes every so often. I love things in color orer, my closet is organized that way and so is my fabric stash. Actually, I do arrange my closet in color order. I have a big walk in closet and find Roy G Biv very comforting. When my clothes start getting all mixed up I know that life is moving faster than normal. I really like lime green. I order my fabric by color, but occasionally I group certain fabric by designer if I think I may work with them all on a certain project. My current favorite color is green! I'm a follower of Jeni's blog think George is adorable. My favorite color right now is green, but nothing around here is reallt very organized at the moment- we're moving shortly. My favorite color (right now) is blue, but I am really into shades of gray, too. I try to be organized - by color, sure - but it never seems to take hold. Most of my things are in chronological order - LOL! Thanks for the interesting series on blog names and the great giveaway! I'm so excited I stumbled upon this blog, that led me to Jeni's blog...you girls rock! Color? Love. Love. Love it! I organize my closet by color. My yarn stash on the other hand, could be greatly improved if I did that (todays project...thanks), and my fabric? Well, as I'm not a huge collector of fabrics, yet, (though, fat quarters don't count, right! ), I have a tendancy to organize in color sequence. Without color our life would be, well, so black and white...oh, and my favorite color is chartruesse green. definitely organize in color order, though thats once in a blue moon when i actually organize? 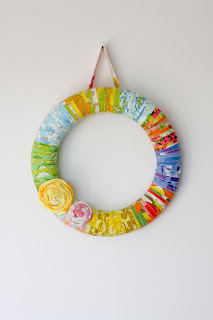 i flow jeni's blog, she's fabulous! great feature! my favorite color is red...i also have my fabric in color order. maybe i should start organizing my closet that way as well. Very cool! I think my favorite color changes every day...but today it belongs in the pink family. i love jeni's blog! i often check out her color posts so that i can get some inspiration and how-to when getting fabrics together for projects! George looks very cute and I love the photos of Jeni's work! I like to organise in colour order, it makes life so much easier! And my favourite colour is (I think, it changes!) somewhere between blue and green - so turquoise, teal, aqua, etc. Thanks for the giveaway! My favourite colour used to be blue, but looking at my fabric stash it is now purple! In my ideal world I organise my wardrobe and stash by colour, but I am a long way away from that ideal world! What order do you eat your M&M's in? I divide by color. Make a pyramid. Eat the excess ones (in color order, browns first) that don't fit the pyramid. Then start from the bottom of the pyramid. Can you relate? I love organizing by color! My favorite color is blue. Using colors, teaching my kids the colors, and having color around...I love it! And I love Jeni's Blog so much. Her tutorials are so wonderful, got to be one of my absolute favorites! Thanks for the wonderful questions and answers and for the giveaway! I loved seeing her work AND color! I love color too. I tend to organize my fabrics by color and I would have to say that I lean towards the brights - green, yellows, oranges. My fave colour is blue.Absolutely blue!!!! 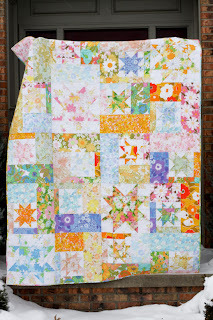 Unfortunately I'm not organized with my stash ... but I hope I'll become an organized quilter like Jeni !!!! I have, from time to time, ambitiously organized my fabric "in color order", but it has slid back into disarray! And I certainly couldn't keep up with keeping my clothes or anythign else organized by color. Favorite color? I am drawn to anything deep and saturated, but am especially into reds and organges right now. My favorite color is blue, now. As a child I was constantly drawing and favored things in purple or the whole rainbow, of course in color order. I wish I lived in more of a color order sort of way. Working on it, both in my fabric stash and in general life. Someone mentioned Fiestaware - attempting to get that into color order has been a challenge, as is just getting myself to stop buying the blasted stuff. My favorite color at the moment is gray. I cannot get enough of it! Oh, and turquoise. I don't really organize things in color order, but I should! My favorite colors are green and blue right now. I am a color arranger. I have a problem, just kidding. It is great and I even go beyond that and have my movies organized and then my cubbies organized and the garage organized. All by color, just kidding again, not by color but organized. I love that and it definitely is soothing and easier to find things for me but the color organizing just sticks to fabric and my clothes because that would be crazy with movies, household items, etc. I love to have things in color order. It always, always appeals to me. My favorite color is probably blue. Thanks for the giveaway. I love Jeni's blog!! (oops, slight problem posting the first time....) The main thing I organize by color is *of course* my fabric stash! It's so much easier to pull together a new project or to see what I need more of in my stash when it's all arranged by color. My favorite color is blue - evident in the overflowing blue drawer of my stash! Blue is my all-time favourite colour. My favorite color is green! And I used to organize my clothes by color, then I had a baby and now I'm lucky to even hang my clothes! I'm a very organized person (you should see under my bathroom sinks!) and I just love Jeni's blog. Not gunna lie, I've stolen more than a few ideas from her! I LOVE In Color Order. One of my all time favorite blogs. My fabrics are organized by color and type thanks to her!!! The rest of my life... lol not so much. Thanks for the chance to win! Hi Jeni!! My stash used to be organized by fabric line. Then sort of by colour family. Now it's just a total mashup in need of reorganization. Most likely colour order is the way I'll go. Based on my scrap drawers, I'd say my fav colour is blue for quilting, but I have an awful lot of lime green which I really don't like that much (and would never wear as clothing). Very strange! yes...i too love to organize in color order...a favorite color is hard to pick but red is my go to color...we have a beautiful red floor in my studio and i l o v e it! I LOVE Jeni's blog! It's one of my favorites :) I'm not organized enough to order my fabric (or anything in my life, really) by color, but my favorite color today is orange!!! I feel like it's a color that just inspired me to be creative and original! Thanks for the giveaway - Jeni's tutorials/patterns are amazing!!!! My favorite colors right now are green and blue, but there's no logic to the way my fabric is organized. I tend to keep it all mixed up and see from there which pieces seem to go together for my current project. 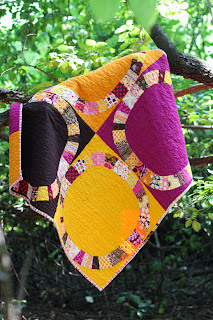 Thanks for the chance to win Jeni's pattern; I've had my eye on it! Now that I think of it, I do organize my closet in color order. Not so much my fabric though. I tend to separate it by designer with the oddballs going by warm or cool. Fun post! I follow Jeni's blog already and love her posts. About the only thing organized by colour in my house is my stash and yes it is in colour order. :) My favourite colour is wine. ;) Thanks for the giveaway! I do love reading Jen's blog. I try to organize by color. It's been a lot easier since I bought the wire basket system from IKEA. My favorite colors?? Hummmmm, I love pink, and blue and red. Yep they are all my favorites. I do like to organize things 'in color order' and my favorite color (right now) is red. Most of my fabric is in color order. I do keep a few groups separate. This past year I reorganized my fabric following all the info from Jen's Blog. My favorite color is orange. My favorite color is blue. I am a blue-eyed blonde, so even my skin is kinda blueish. I try to organize my fabric by either color or theme. . . All my 30's prints are together in two stacks in my closet, my Christmas and Patriotic fabrics are co-mingled in two other stacks 'cuz the reds often work for both holidays, my fall colors are in two other stacks, my batiks in another, etc. My scraps, on the other hand, are a total mess. And I organize my fabric by designer or project. The fabric scraps or my stash is organized by color order. I have been following Jeni's blog for a while. You could say that I'm an "organizer" as my favorite toy is a label maker! Yes! I am an organizer by color, unless I was a certain stash of fabric to stay together by designer. I follow her blog. I too am a color orderer! I have all my clothing hung in color order and by sleeve length, so there are three complete rainbows in my closet, one for sleeveless, short and long sleeved shirts! I follow her blog. I organize my fabrics by color. My favorite color is yellow, so most things I own tend to be that color. 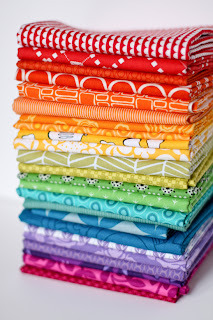 Yup - all fabrics are organized by color unless it is a novelty print - they get their own spot on the shelf. My daughters tease me about my affinity for blue so now I am trying to prove them wrong and branching out. I love purple right now! I keep my fabrics in color order as well. Thanks for the giveaway, Jeni! 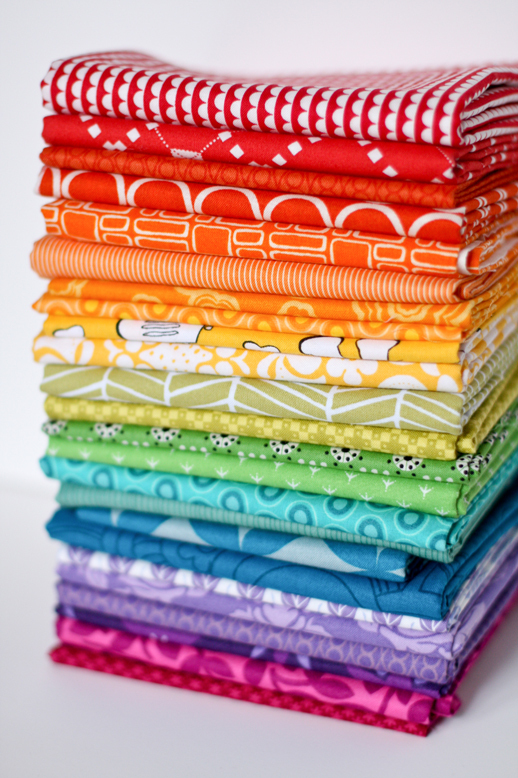 I Love to organize my fabrics by color! Yes, I do organize in color. :) I can't help myself. I love color!!! Brighter the better too. Thanks to Jeni, I have my fabrics in color order, plus my wardrobe. My fave color is pink, hot pink! I wish I could keep things in color order. I'll settle for plain old order of any kind here. My favorite color has always been Yellow. I even drive a yellow beetle. But rest assured that they will be displayed in colour order, once I get my next place!! I am lucky to have color familys in plastic tubs. I have been a follower of Jeni's blog for a while. I dream of being able to see colors the way she does. I love the way she puts colors together. I love Jeni's blog. I'm terrible with colors and her blog is of great help! My favoutite colors are aqua and red, although my wardrobe is full of black! I try to keep my stash in colour order and Jeni was the person who inspired me to do so. I try to fold my fabric the way she does as well. I keep saying try because I get lazy and I also have a stack of fabrics I working with to come up with a new quilt. My favorite colour is green, but when it comes to fabric, it's so hard to choose, I love red, blue and yellow too! i have always organized my closet and fabric in color order. My fave color can vary depending on whether we are talking clothes, home decor, cars, flowers, etc but overall i would say my favorite is pink. Jeni's blog is one of my favorite. she always has great photos, info, and tutorials with great instructions! My favorite color is green and I love to organize in color order. I follow Jenni´s blog, awesome!. No I organize my fabric with how I am going to use it. Example, girl fabric, boy fabric, or a fabric line. I have been following jeni's blog for quite awhile. My favorite color is blue. I love Jeni's work, her explanations and her colour order. I like to play around with colour, always trying out different combinations. My favourite colour is blue - any shade or tone. In my class room, my signature colour is turquoise/acqua and everything fits in. At home, where there is a lot more blue and white in the house, I have a white desk with hot pink interiors and files. Love all colour really! I love Jeni's blog! I sometimes organize in color order, but then I move on to something else. I love looking through and organizing all my fabric. My favorite color is yellow. Thanks! I love Jeni's blog! I don't organize things according to color, but I do like having things lined up, and on my desk at work everything is perpendicular to one another. My 18 month old daughter lines things up too, so maybe it's hereditary! I do organize by color order- my stash and my clothes. My books are organized by size. I don't know that I have a favorite color. It depends on what it is for. I organize my shirts and some books in colour order. My fave colour is green. I do hang my cloths in color order and of course my fabric. Favorite color........ maybe blue. Thats a hard one. My favorite color is orange!! And I do organize my closet in color order. My fabric needs to be re-arranged right now but I do like it to be in color order! I'm definitely a 'color order' person. Sometimes I think it's part of my synesthesia. I am glad to know that there are others who are as compulsive about organizing in color order as I am! Oh, I've loved this bag! And this blog!! My life revolves around color. It makes me so happy!! I do keep my fabric and buttons in color order but not much else. Takes too much time and I have too much stuff! I started out organizing by color but it got messed up and now I hate to take the time to 'fix it'. 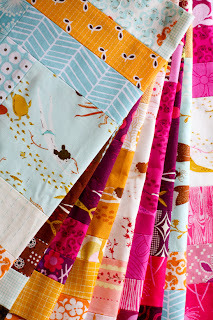 I love Jeni's blog but my fabric - is very limited to pinks and blues since that is what is available here in Malaysia. 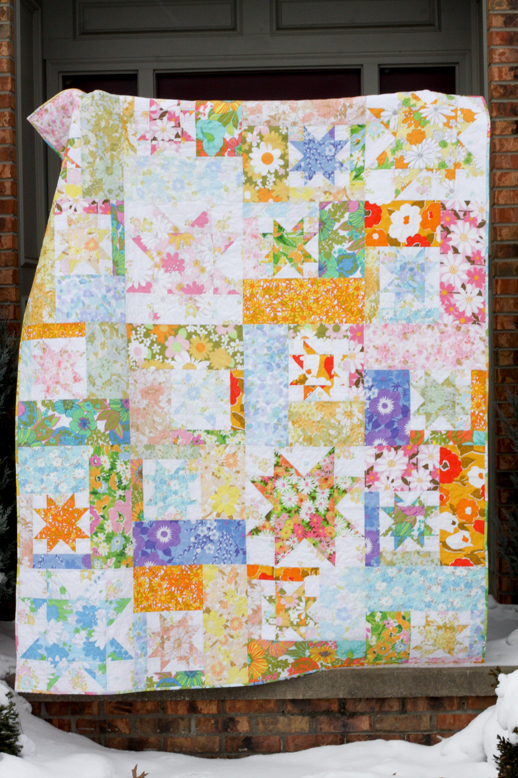 At the moment, I'm working with batiks from FQ bundles so my stash will be very limited. My favourite color is teal. Yes, I organize according to color most of the time, but lately have been keeping collections together (such as Reunion, Pear Tree, Lotta Jannsdotter, Outfoxed as I know I will use them together mostly). My favorite color is red. I love colour, especially reds and oranges. I really love these two complimented by browns; makes me think of the beautiful Australian ourback with it's red/orange ground, mmmmm. I try to live in colour order as I really can't stand disarray, but when it comes to colour, the more mixed in together the better, so usually my stash becomes a great big 'dog's breakfast' and I just love it! I follow Jeni's blog which is how I found yours. 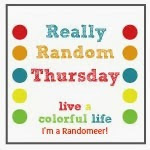 I've been reading Jenni's blog for a while, and as much as I love to organize things in color order, I just don't have the eye that she does for it! So often, when I'm puling fabrics, I pull up her blog to help me out. After having my current sewing room for 20+ years, I'm happy that I just got it organized into a usable fashion. I do have the fabrics somewhat in color order but one rummgage for fabric certainly messes that up! I don't really organize anything by color order. I should! My fabric is sorted by cools, warms, and neutrals (with some lines kept together). My favorite color is green right now - springy or appley green. Thanks for the chance! I organize my fabric and my closet by color. My favorite color changes and it is red now. Yep, I organize my fabric by color ... although my fabric stash does have a tendency to migrate to a "gosh, these fabrics look gorgeous together" theme from time to time. Then I leave the mated fabrics together so I don't forget I've seen them marry so well. Jeni's blog has been on my "must read" list for quite a while. Her quilting and general outlook on life are refreshing. I thoroughly enjoy her posts ... and, of course, the latest photo of George! I actually do! In fact my husband made a big bookcase for me as my Christmas gift - to store my fabric on. The first thing I did was sit down and sew 'scrap bins' out of a tan canvas with each lining the color of the scraps that would go in it, and a strip of fabric across the front in that color so I would know what was in it no matter what angle I looked at it from. I have ROYGBIV and a Multi/Black/White. They look so pretty lined up on my shelf! My favorite color is purple, but I have a hard time finding enough nice purples for my stash. I've always organised things in colour order. I can't eat Smarties or Skittles without sorting them first! No favourites, though...it's equal opportunity in my house! I definitely organise fabrics, threads, buttons embroidery floss by colour! Not my wardrobe at all! My favourite colour is turquoise at the moment. I used to organize my closet by color--then I had kids. Now I'm lucky if my clothes are clean, much less put away. My fabric, though, which the children typically do not touch--heck yeah it's organized by color! I love all sorts of color ... not necessarily in color order, though. My favorite colors are blue and green. I organize some things in color order -- like my fabric! My favorite color is green with purple a close second. I love the drawstring bag pattern and would love to win it. Thanks! As a new quilter l am learning so much about colour. I haven't enough colour to arrange fabric in order yet. As a knitter though my wool is arranged in colours. Lately my favorite color is red. But I love all colors. Thanks for the giveaway. Of course, we love each and every color. We're a bit partial in that way, but we especially love color order!